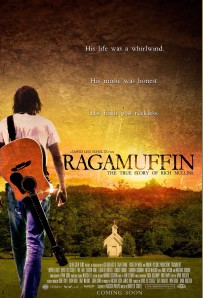 Los Angeles, Calif. – (February 27, 2014) The Ragamuffin film, based on the life and legacy of best-selling Christian music singer/songwriter Rich Mullins, is set to premiere in select theaters on May 2, 2014. The Color Green Films full-length feature will release in 15 cities around the nation including Nashville, Dallas, Indianapolis, Columbus, Atlanta, Phoenix, Colorado Springs and Wichita, among others. Ragamuffin is supported by a diverse campaign which includes comprehensive social media and promotional efforts that will reach into the faith & family market and is currently backed by a diverse grassroots marketing campaign led by Movie to Movement™. In conjunction with the theatrical release, the Ragamuffin Movie Tour recently launched and is currently screening the film in 70+ cities across the nation. Debuting to a sold-out house at the Orpheum Theatre on Thursday, Jan. 9 (the first of several screenings planned ), the tour will run through the end of April 2014 hosting screenings in small venues – churches, college campuses, community theaters, etc. Movie to Movement™ was created to promote a culture of Life, Love & Beauty. They do this through the production of their own films, as well as sharing others. Movie to Movement believes that film is today’s most influential medium and that they can change culture, but first they must change Hollywood. By supporting Movie to Movement™ promoted and produced films viewers are supporting good films and send a message to Hollywood that more need to be made. For more information on Movie to Movement please visit www.movietomovement.com.